Hispanic Alliance for Career Enhancement (HACE) will host its Career Conference Thursday, Aug. 4 at Navy Pier. For more information or to register, visit www.haceonline.org. For 29 years the Hispanic Alliance for Career Enhancement (HACE) has fostered the skill sets of Latinos from across the country to be able to compete in booming industries. 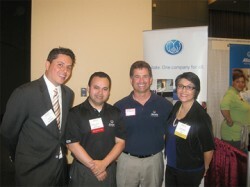 “I truly believe in HACE’s mission,” said Mario Vela, director of outreach for HACE. “This is an organization that is truly committed to developing skills and placing Latinos in top positions.” And in order to combat the bleak reality that is the job market, HACE will be hosting its ever popular Career Conference at Navy Pier on Thursday, Aug. 4, brining exhibitors from a variety of backgrounds. “This career conference is an opportunity for our constituents across the United States, to meet face-to-face with our corporate partners,” said Vela. “This is an opportunity for someone that is interested in a career change, or who wants to learn about different opportunities, or is seeking work at this point in their career.” This year, attendees can expect to meet with representatives from Federal Reserve Bank, Verizon, US Cellular, Walgreens, and much more. Vela, who participated as a career coach, offered tips on how attendees can set themselves a part from those vying for the same position. Be prepared when you go to our career conference. This is not a meet and greet. Or a ‘Hi, how are you doing. This is my background, what do you have to offer me?’ The best way to take advantage of this opportunity is to go prepared. Do research and understand what the company has to offer and match your skill sets to that opportunity. So if you are looking into a position in HR, or if you are looking into a position in accounting, finance, or in engineering, or a variety of different opportunities from these organizations, go prepared. Have a conversation on how your skill set or your experience aligns with that company. They are not warmed up. Let’s say they kind of go cold and just say ‘hi’ and expect the recruiter to handle the conversation. This is an opportunity for the constituent to have a conversation about themselves and demonstrate that they are prepared for an opportunity with that organization. Research, be friendly, smile, be warm, and be open to conversation. The recruiters are there taking time from their workday and they are looking for individuals to fill these positions. If someone goes to a career conference and has a short conversation just about a couple of their skill sets, but they don’t really know anything about the organization, that’s not really someone that is prepared. A person who is prepared knows the positions that are available and understands what opportunities there are, understands the corporate culture, has done some homework, and has maybe connected with someone from that organization. Lastly, be comfortable. One of the suggestions we make is to practice with someone your 60-Second Elevator Pitch. This is an opportunity for you to really hit those key marks on how you intend to sell yourself to that organization in a short amount of time. Think about what key points you want to highlight about yourself and just sell it. A toolkit would be, your 60-second Elevator Pitch, your resume and business card, friendliness, and inviting the organization into the conversation because potential employers are looking to see if you fit their culture. That makes all the difference in determining the trajectory of your career. If you are able to talk about your key strengths and accomplishments in a way that is engaging, that will go a long way. In my experience I have seen some constituents not bring their A game to the conference. This is not a place for you to be humble. This is an opportunity for you to talk about your strengths, your accomplishments, your work experience, and what you have to offer as an employee. This is a time when you really have to sell your skills and what you can bring to the table because that will lead to the interview. It’s completely fair to be nervous. As a first generation college student, navigating the non-profit, navigating the educational environment, and navigating the work environment can be daunting. That is why we are here to help in that process. It is really about practice. Practicing with someone you don’t know can be intimidating, but the more you practice, the more you engage in conversation, the more you learn to highlight key elements of yourself, the better you will become. No matter where you are in life, whether you are college student, a person thinking about a career change, or a person looking for a job, this is a great opportunity for you to practice and network. 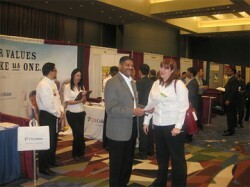 For more information on HACE’s Career Conference, visit www.haceonline.org. © 3052 Chicago Hispanic Newspaper, Lawndale News, Hispanic Bilingual Newspapers, Su Noticiero Bilingue. All rights reserved. XHTML / CSS Valid.